The euphoria bubbling around gold may have gotten another big boost -- not that it needed one. Hedge fund manager John Paulson is raising a new fund that will focus on gold and related items like miners and derivatives. The move by Paulson -- who made a fortune betting against real estate -- is seen as another vote of confidence for gold prices already near all-time highs. But investors should avoid getting star struck and take a careful look at the volatile gold market. 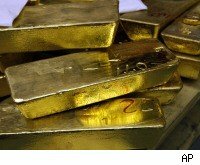 For starters, the mania surrounding gold now shows many of the telltale signs of a bubble. And while a skilled trader like Paulson might know how to ride and when to bail on the momentum, other investors could get caught by a sudden unwinding. In addition, investors should note that Paulson would likely be able to collect massive fees excluding potential profits on the new fund. Taking advantage of his growing celebrity as investors rush to gold by locking down more funds may be as much a motivation as a bullish outlook for the metal. Paulson's move comes at a time when investors seem to have thrown risk considerations out the window and can only argue about how astronomical returns are likely to be. Even wild-eyed predictions of a tripling from current levels to the $3,000 mark now seem passé: This week, French investment bank Societe Generale outlined a scenario that could take prices upwards of $6,000 an ounce. But as the mania around gold explodes, a sliver of investors have started to point out the eerie similarities between gold and prior boom-to-bust markets like real estate and tech stocks that preceded it. Some note that it's time to get scared "when everyone is on the same side of the trade and even your barber starts talking up gold stocks." While the feeding frenzy initially creates an upward spiral -- prices go up as investors pile in, leading to higher prices -- that momentum can rapidly reverse as well. Many new investors aren't buying gold as a supposed hedge against inflation or because they believe paper currency will decline sharply but simply because gold seems to be going up. "The same situation that occurred with real estate in 2002 has occurred," says Derek Blaine of investophoria.com. "People don't buy [gold] as money, they don't save and store wealth with it, and they are seeking capital gains." Some prescient investors say much of the move results from a self-reinforcing upswing. Charles Schwab's chief investment strategist, Liz Ann Sonders, who was among the first to call a turn in the economy during the spring, recently said that the rally in gold was due to "performance chasing." In an interview with DailyFinance,veteran analyst Dennis Gartman says much of the demand was being driven by money managers who missed the rally in stocks and are now hard pressed to show gains as the year ends or as they face investor withdrawals. "If you are a portfolio manager and you did not participate in stocks, the pressure to perform gets stronger every single day," Gartman says. Like other big name hedge fund managers, Paulson would be shrewd to make hay while the sun shines. But fortunes can change rapidly for even superstars, and other investors should be cautious when leaping in after them. During the last decade, Citadel Investment Group head Ken Griffin saw his funds swell on the back of strong performance until the firm got hammered after big bets on credit default swaps in 2008. But while the funds still have a way to go to make up for the losses of the year, Griffin often gets to charge a gargantuan 4% to 8% of assets under management according to The Wall Street Journal. Most mutual funds charge less than 2%. Like Paulson, hedge fund titan Phil Falcone, meanwhile, also made a fortune betting against the subprime crisis. But his Harbinger Capital funds subsequently stumbled by making ill-advised bets on properties like The New York Times that other investors would have been wise to avoid. And during the most recent stock market boom, firms like Blackstone Group (BX) and Fortress Investment Group (FIG) used the widespread infatuation with private equity and hedge funds to stage initial public offerings. Shares of both companies have performed poorly: Blackstone is off almost 60% from 2007 levels, and Fortress has dropped more than 80%. Investors should note that big-name money managers excel at taking advantage of the hype surrounding them as much as anything. Paulson's push into gold may be no exception.